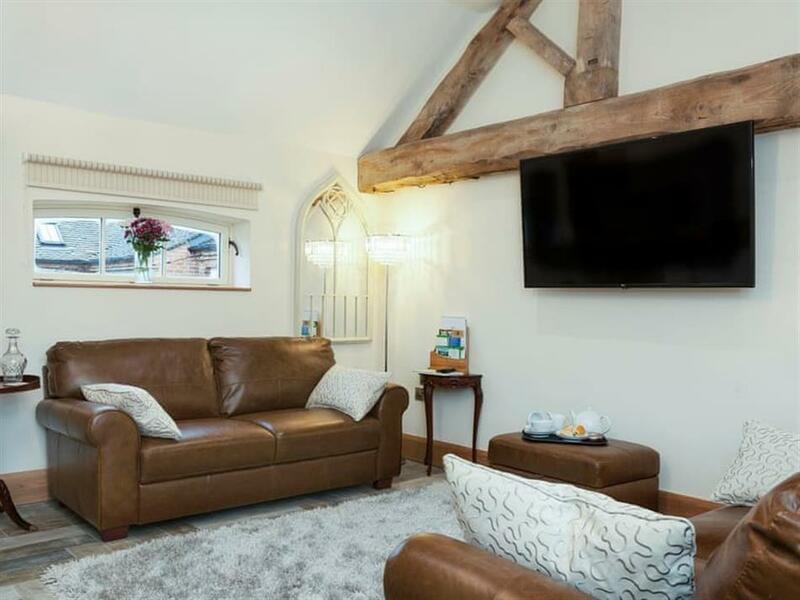 The Dairy at Ostrich Barns in Longford, near Ashbourne, Derbyshire sleeps 4 people. 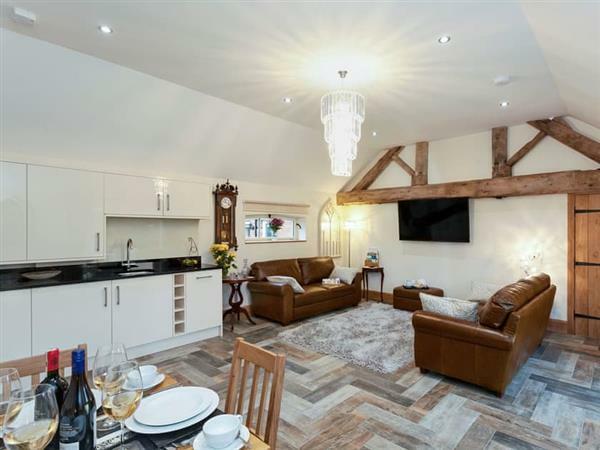 Ostrich Barns near Ashbourne can be found in the beautiful village of Longford, next to the owners’ home; Ostrich Barns are two stunning properties located behind electric gates. With every attention to detail thought of, these fantastic properties are the ideal place for a getaway with friends or family. Both properties boast co-ordinated and soft furnishing throughout to offer that sense of comfort. The Dairy stands detached and offers a private garden and beautiful accommodation for families and couples alike, with two en-suite bedrooms, and a cosy open plan living space. The village pub is situated a stone’s throw away from the properties in a quiet little village, along with a network of footpaths to stroll along. A little further afield, Dovedale, the Manifold Valley and Tissington offer great cycling and walking opportunities. Situated just 6 miles south of Ashbourne, Longford has wonderful views over the Derbyshire countryside and is within easy reach of many of the surrounding attractions. There are two fishing lakes available within 3 miles away. Why not visit Ashbourne, once a fashionable social hub in the 18th century, the town is rich with original cobbled lanes, old market stalls and grand Georgian buildings lining the streets. It is also home to a good selection of restaurants, interesting shops and traditional coaching inns. Longford is also a great base to explore the nearby Peak District delights such as Matlock and Matlock Bath, which has been attracting visitors since the 17th century. A host of attractions await including Gulliver’s Kingdom and the Peak District Mining Museum. Magnificent views down the gorge can be enjoyed from the cable car which takes visitors up to the Heights of Abraham, a great place for all the family with its show caves, nature trail and water gardens. A little further north is the market town of Bakewell, and the world renowned Chatsworth House and Gardens, a lavish stately home with noted art collection, plus a playground and farmyard in the lush grounds. The famous Alton Towers theme park is within easy reach, just 13 miles away. After a long day exploring there’s nothing better than returning to Ostrich Barns, popping your feet up and enjoying all that these wonderful properties have to offer. The shop is 4 miles from Ostrich Barns near Ashbourne, with the pub 200 yards and the restaurant is 1 mile from Ostrich Barns. The Dairy can be booked together with The Hayloft (ref UK4064 [The Hayloft]) to sleep up to 10 people. The Dairy is all on the ground floor. Living area: With Smart TV with Amazon Fire TV Stick, beams and tiled floor. Bedroom 1: With zip and link super king-size bed (can be twin beds on request), Smart TV, Bose Bluetooth speaker and en-suite with shower cubicle and toilet. Bedroom 2: With king-size bed, Smart TV, Bose Bluetooth speaker and en-suite with shower cubicle and toilet. LPG underfloor central heating, electricity, bed linen, towels and Wi-Fi included. Use of freezer and washing machine. Welcome pack. Lawned courtyard garden with patio and garden furniture. Bike store. Private parking for 2 cars. No smoking. Holidays at The Dairy, Ostrich Barns run from Friday to Friday. For a better idea of where Ostrich Barns - The Dairy is, you can see Ostrich Barns - The Dairy on the map below. Ostrich Barns - The Dairy is in Derbyshire; should you be on the lookout for a special offer, you can find all the special offers in Derbyshire. It's always worth checking to see what is on offer at the moment. Do you want to holiday near Ostrich Barns - The Dairy (UK4183), you can see other cottages within 25 miles of Ostrich Barns - The Dairy; have a look to find your perfect holiday location.